What stories will I tell when I return from the lands of Marco Polo, Tamerlane, and Genghis Khan? And who will listen? What will you choose to hear? The first step has been taken: Gunter and I are underway, and so excited! 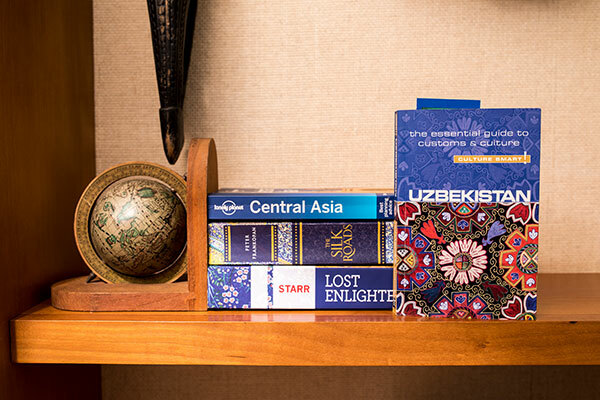 We’re flying Turkish Air from San Francisco to Istanbul, and after a brief layover, on to Tashkent, Uzbekistan. I enjoy reading about the history and culture of a country before I enter. This long flight gives me plenty of time. 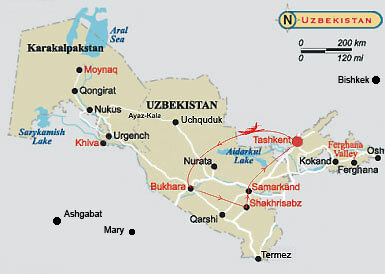 Although Uzbeks make up about 70% of the population, the country is ethnically diverse, with Russian, Tajik, Kazakh, Korean, Jewish, Armenian, Tartar, and other communities. Over the centuries, waves of mostly Turkic-speaking nomadic tribes passed through the area—interspersed with Greeks, Chinese, Arabs, and Mongols. We’ll meet descendants of a mix of cultures, dynasties, and cultures whose ancestors emerged and disappeared along the famed Silk Road. After the breakup of the Soviet Union and independence in 1991, many Russians fled and major cities who had been 30-50% Uzbek are now close to 100% Uzbek. I’m amazed to learn that Uzbekistan has a literacy rate of nearly 98%. Teachers are highly respected, and a higher social status is ascribed to those with a college degree. Tashkent, our first stop, is the capital of independent Uzbekistan and by far, the nation’s largest city, with about 3 million population. One of the oldest cities, Tashkent was destroyed by Genghis Khan in 1219, but was later rebuilt and became a strategic center of commerce, trade, and scholarship along the Silk Road. Unfortunately, in 1966, a 7.5 earthquake devastated much of the old colonial adobe structures of Tashkent. Only a few older structures survived, so it was rebuilt as a model Soviet city, with wide tree-lined streets, vast squares, and fountains. Since then, many Soviet-era buildings have been taken down or remodeled with modern tinted glass, white walls, and concrete columns. Today, Uzbekistan’s democratic president, Shavkat Mirziyoyev, who came to power in 2016 following the death of his dictatorial predecessor Islam Karimov, has initiated a new development, Tashkent City, a magnet for foreign investors. He’s kick-started an economic revolution to transform the Uzbek capital back into a business hub for central Asia and beyond. But rapid growth has its downside: many houses in the historic mahalla district are slated for demolition to make room for glitzy silver skyscrapers, luxury apartments, hotels, and offices. The process reminds me of how we saw China demolish thousands of hutongs in Beijing to widen freeways prior to the 2008 Olympics. The future of The Silk Road. I’m a curious traveler. Yes, I want to photograph those famous teal-blue mosaic tiles brought into the Silk Road markets by the Mongols. But I also want to gain an understanding of these people of Uzbekistan who form a mosaic of different historic, ethnic, class, educational, and cultural backgrounds. And I want to understand what the future holds these countries of Central Asia. We are seeing the birth pains of a new world emerging before our eyes. We in the West wonder where the next threat may come from, how to deal with extremists, how to negotiate with states who seem willing to disregard international law, and how to build relationships with peoples and cultures about whom we’ve spent little time trying to understand. Meanwhile, “networks and connections are quietly being knitted together across the spine of Asia; or rather, they are being restored. The Silk Roads are rising again.” __Peter Frankopan.